The city has a new mayor with a progressive mandate, but its schools are reeling from the market-based reforms Cory Booker introduced. Every time Newark shows up on the national radar—from Cory Booker’s celebrity turn to Mark Zuckerberg’s $100 million gift to Ras Baraka’s victory in the mayoral race earlier this month—its schools have been in the spotlight. In Mayor-elect Baraka, the school reform project inaugurated under Booker and Governor Chris Christie has met its most formidable opponent yet. But despite Baraka’s win, not to mention a flurry of sit-ins, walk-outs, protests and pickets, the transformation of the school system into a showcase of neoliberal ideas about education is unlikely to stop anytime soon. That’s troubling news for students in the district schools, such as those at the Hawthorne Avenue School. Hawthorne could have been a model for urban education. The Newark, New Jersey, K–8 school has raised its test scores in each of the last three years. The hallways that teachers describe as “chaos” four years ago are now quiet, save occasional bursts of laughter. Its performance on last year’s tests, on which it met all state benchmarks, compelled an assistant superintendent to make a personal visit to congratulate the faculty. So the community was stunned when the district leveled the educational equivalent of a death sentence on the school. At a public forum last December, the Chris Christie–appointed superintendent Cami Anderson announced that about a quarter of Newark’s schools would be closed, repurposed, consolidated or otherwise transformed. Hawthorne would lose grades 5–8, and two outside operators would assume management of younger grades. Every teacher would have to reapply. Housed in a stately though decaying four-story brick schoolhouse built in 1895, Hawthorne draws its enrollment from the Clinton Hill neighborhood of Newark’s impoverished South Ward. Nearly 90 percent of its pupils are African-American and 94 percent are economically disadvantaged. Although less than a third of its students score proficient in reading, Hawthorne’s growth puts it in the ninety-fourth percentile of comparable schools statewide. Its roster has grown consistently for three years. Now the school is in limbo. “Teachers don’t know where they’re going, students don’t know where they’re going,” says Sergio. Why has this school, whose academic gains outstrip those of every school in its local peer group, been targeted for turnover? Parents have lobbied officials, penned letters and protested to get an answer, but Superintendent Anderson hasn’t relented. “She doesn’t know what our kids need,” says Sergio. The upheaval at Hawthorne comes amidst one of the most dizzying spells of school reform a city has seen since Hurricane Katrina turned New Orleans into a laboratory for market-based reforms. On May 20, members of the Newark Students Union overtook a district meeting chanting demands for One Newark’s repeal and Anderson’s ouster. The board members filed out after a few minutes, and the students stayed the night. Amidst all this, Anderson has moved to lay off more than a thousand teachers over three years, an attempt to plug a budget deficit driven by the costs of the burgeoning charter school sector. Students who leave the district for charters—privately managed nonprofit schools exempt from some regulations—take 90 percent of their funding with them. A quarter of Newark students currently attend charters, a share that will rise to nearly 40 percent by 2016. As it happens, Mayor-elect Ras Baraka was the principal at Hawthorne before taking the reins at Central High School. The son of the late radical poet Amiri Baraka, he’s used his public school credentials to assail the reforms Anderson and Christie have championed. Baraka’s education agenda begins with a moratorium on One Newark. “It’s drastic and radical,” Baraka says. “It completely disrupts families’ lives.” Within a week of his election, Baraka unveiled his own community-driven schools blueprint, the Newark Promise, which would push for expanded services and local control. Newarkers can point to two signal events, both in 2010, that ushered in the era of major reform: Chris Christie’s rise to governor and Facebook founder Mark Zuckerberg’s $100 million donation to reform the Newark school system. 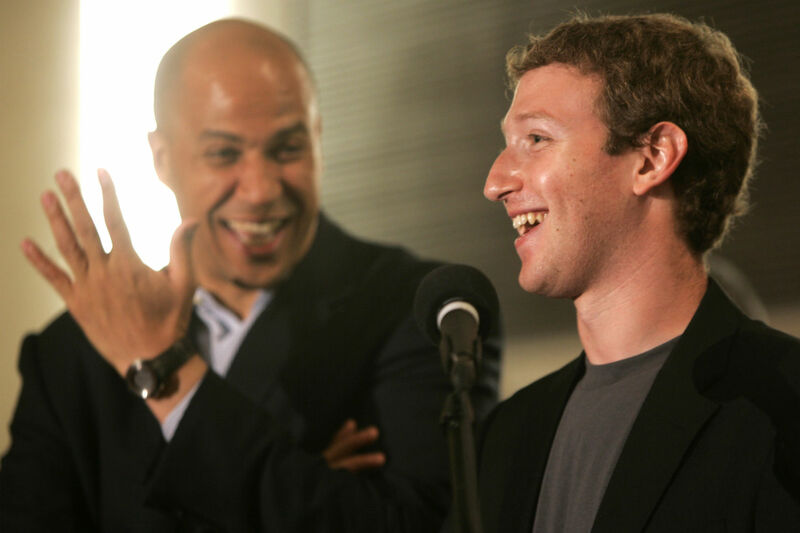 Although Christie was cutting nearly a billion dollars from New Jersey’s education budget, including over $40 million from the Newark schools he found “absolutely disgraceful,” Zuckerberg’s fortune gave Booker the political cover to endorse Christie’s education politics. “Booker used that spectacle to pronounce that he was in favor of the school reform project,” says Junius Williams, a Newark attorney and civil rights veteran. Booker’s team established the nonprofit Foundation for Newark’s Future to distribute the young billionaire’s gift and matching donations. One of its first mandates was to recruit a new superintendent. The state selected Cami Anderson, a hard-driving former Booker campaign adviser and New York superintendent who then oversaw education at Rikers Island. In a 2010 e-mail, Booker aide Bari Mattes wrote that the Broad Foundation, a big giver to education reform, was “very interested in knowing who the Superintendent is going to be.” Anderson’s lengthy reform pedigree satisfied Broad, which provided generous early funding. But who would get the dough? As Mattes emphasized in another e-mail, “MZ’s money is not going in to classrooms.” It was soon clear that Zuckerberg’s money wasn’t going to patch holes in buildings that need a district-estimated $1.3 billion in repairs, or hire support staff for the fifth-poorest youth population in the country. In fact, not a cent of Zuckerberg’s money has gone toward hiring counselors, social workers or nurses. Meanwhile, “there have been DRAMATIC cuts to wraparound services,” wrote Mike Maillaro, Newark Teachers Union’s director of communication and research, in an e-mail. Last year, every attendance counselor in the district was eliminated. Hawthorne Avenue reports losing eight support staff members since 2011, including a guidance counselor and two instructional coaches. The school has neither a music teacher nor a librarian. Zuckerberg’s money would instead “create systemic education reform in Newark.” In 2011, it was reported that a full third of the foundation’s cash had found the pockets of consultants. As Dale Russakoff recently reported in a lengthy New Yorker article, that total now sits at about $20 million. Though a smattering of grants have benefitted local causes—after-school yoga ($31,000), book drives ($1.2 million), new district schools ($2.1 million) and sundry others—over 40 percent of the money granted to organizations has left the state. Outside talent and recruitment agencies, for instance, raked in over $4 million to align district staffing with Anderson’s politics. The report would become the opening salvo in the battle to transform Newark Public Schools, and an indication of reforms to come. By early 2012, with a new superintendent and gobs of philanthropic cash at hand, Newarkers were anxious to hear what was next. Anderson held a community meeting to reveal her restructuring plan, the fruit of the FNF-funded audit. The plan sparked protest. Six schools would be closed and eight more would be “renewed”—educators and administrators forced to reapply, a process that has displaced hundreds of teachers. Meanwhile, seven charter campuses opened their doors in 2012. Though the privately managed charter sector had been growing for years, the reorganization plan intensified the competition between charter and district schools for students and their funding. Today that process is accelerating. One Newark reprises the previous plan, with four schools to be closed (or “repurposed”) and nine “renewed,” but it adds a novel element: three district schools are slated to be taken over entirely by charter schools. At Hawthorne, TEAM academy charter will operate grades K–1, while the K–4 will remain a district school under new administration. Newark’s charter sector receives millions in philanthropic support on top of per-pupil funding. Donations tied to FNF have brought more than $21 million to charter schools, including an early $16 million from Wall Street donors such as venture capitalist John Doerr. The Newark Charter School Fund, where FNF’s current CEO served as vice president of finance and operations, has received over $4 million from FNF to grow the charter sector. Anderson justifies charter growth as an effort “to align supply with demand.” This February she sought a waiver to skirt tenure law to lay off nearly a third of Newark’s district school teachers, based not on seniority but “performance” measures. “Families are ‘voting with their feet’ in search of excellence,” reads the district’s rationale for the layoffs. These efforts follow a celebrated 2012 teacher’s contract agreement, which Zuckerberg’s money helped pay for, to the tune of $48 million. Much of that consists of retroactive teacher pay, but the contract notably gives test scores weight in determining who gets bonuses and who gets labeled ineffective—a policy goal of reformers, but not the legal means for imposing mass layoffs. For decades, Jersey education politics hinged on a decades-long series of state Supreme Court decisions, called Abbott v. Burke, that mandated supplementary state spending in high-need districts. Such concerns have taken a backseat to the choice-based policies now in vogue, a paradigm shift best illustrated in the birth and demise of the once-promising Global Village Zone project. Drawing from the famed Harlem Children’s Zone, Global Village oversaw both administration and instruction at seven Newark schools. At Central High, Global Village provided extra school time and developed programs to improve school culture. “That was a blessing for us,” says Mayor-elect and former Central Principal Baraka, who boasts of increasing graduation rates from around 50 percent in 2007 to over 80 percent now. The final blow came when the Ford Foundation, the project’s major benefactor, balked at continuing funding. “They wanted a signal from the district that our work was in alignment,” says Noguera. The signal never came. Ford’s last grants to the Global Village project came in 2011, the year it awarded the FNF $1.1 million for extended school time. The Ford Foundation claims its grant to FNF continued Global Village’s efforts to expand learning time. But the rest of Global Village’s initiatives—from health services to professional development—fell victim to the district’s shifting priorities. Anderson’s handpicked renew schools began receiving extra time and other wraparound services that Global Village had promised. In 2012, Global Village disbanded. Global Village’s demise also highlighted what some might call the hypocrisy of the market-based reform movement, which consistently emphasizes that its sole purpose is to improve the lives of poor children. While Noguera’s initiative bore a strong resemblance to the Harlem Children’s Zone, in its holistic philosophy toward urban education as well as in its name, it differed in one salient aspect: Global Village worked in district schools, not charters. Perhaps that difference helps explain why the school reform movement that celebrates Harlem Children’s Zone was happy to see Global Village languish. “Choice” is the byword of Newark’s reform proponents: schools open and close depending on the flow of families. Yet those who’d prefer neighborhood public schools see their choices dwindling. Smith lives in Newark’s South Ward, an epicenter of charter growth. Under One Newark, three South Ward schools will close and three more will see charters move in—including Hawthorne Avenue and Madison Avenue, the two district schools closest to Smith. Nearby Bragaw elementary will also come under TEAM charter management. Parent Tawanda Sheard describes the journey her fourth-grade daughter would take to attend the closest district school: “Abandoned houses, liquor stores, guys on the corner”—and a jaunt over Interstate 78, which bisects the neighborhood. Some don’t see that as a problem. Former Deputy Commissioner of Education Smarick wrote in 2012: “Chartering can replace the district. And it can happen in Newark.” Appointed in 2010, the self-described “gung-ho reformer” promptly expanded the state’s charter office. Smarick, like many, believes Newark charters produce better results. He cites a national study, CREDO, which found students in Newark charters gaining the equivalent of seven months in reading and nine in math, compared to virtual counterparts. These numbers, however, reflect substantially different testing populations. About 15 percent of district students have special needs, compared to under 9 percent of those in charters. One in ten district students is an English language learner, compared to less than 1 percent of charter students. All in all, no Newark charter teaches the same share of the neediest pupils as the average district school. Charter operators will enter four campuses under One Newark. North Star Academy, for instance, will take on management at Alexander Street School. Nearly 90 percent of students at Alexander qualify for free lunch, which indicates the lowest income bracket. The lowest-income students, by contrast, make up about two-thirds of North Star’s enrollment. Similarly, Alexander Street enrolls a slightly larger percentage of students with special needs than do the nine schools in the North Star network. “I don’t think there’s any basis for the suggestion that these charter operators can do well by the kids they’ve already left behind,” Baker says. “The ones that have had high performance generally serve a much lower-need student population.” In an e-mail, a North Star representative disputed that characterization, arguing that many district students are inappropriately classified with special needs, and that North Star free-lunch students perform as well as reduced-lunch students. Still, thousands of parents have reportedly crowded onto waitlists for charters, drawn by plentiful resources, high staff-to-pupil ratios and orderly hallways. Their continued expansion, says Baker, will mean “increased shares of kids with moderate or severe disabilities” in district schools. District documents show nearly all of the students with the most severe disabilities entering district high schools in coming years. Newark now finds itself with a mayor whose authority is circumscribed by state control pitted against a governor whose attention is divided between scandal and 2016. Union chief Del Grosso has suggested to his members that Anderson’s departure is imminent, but the superintendent has made no indication that One Newark will change course. But Baraka has the bully pulpit. “A new mayor could champion what’s going on in neighborhood,” says Williams. Baraka chose Lauren Wells, who administrated Global Village during its tenure, to help pen his education plan. And he’s vowed to better involve the community in school governance. “We don’t have to give up on the public school system,” he says. Owen DavisOwen Davis is a New York-based writer focusing on education and social policy. He was an intern at The Nation. He tweets @of_davis.